A bomb has exploded aboard a Trans World Airlines Boeing 707 at Las Vegas airport. 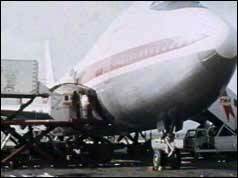 No-one was injured in the blast which destroyed the cockpit of the aircraft as it stood empty on the tarmac. The explosion happened hours after an anonymous phone caller threatened TWA with a series of bomb attacks unless �760,000 was handed over. The caller instructed airport officials at Kennedy Airport in New York to go to a locker where they found a note, which said there would be explosions at six hourly intervals on four of the company's aircraft. Sniffer dogs found a bomb, which consisted of 3lb (1.36kg) of plastic explosives and a timing device, aboard a TWA aircraft at the airport in New York, 12 minutes before it was timed to explode. It was found in a case labelled "crew" in the cockpit. A few hours later police boarded a second TWA jet at the airport but nothing was found. The aircraft which exploded in Las Vegas was thoroughly searched and left New York after the first bomb was discovered. It flew to Las Vegas with only 10 passengers and was searched again once it landed. The aircraft was then put under armed guard before the plane exploded seven hours later. Debris was blown more than 100 feet (30 metres) away but two security guards escaped uninjured. One of them said: "It sounded like dynamite. I could see pieces of the plane flying through the air." The security department at the International Air Transport Association suspects that five people, who each hold Middle Eastern passports, may have been involved in the plot. TWA has ordered worldwide checks on all 240 of its aircraft following the initial bomb threat. US President Richard Nixon said that the government would mobilise all resources "until the current threat is crushed." TWA never handed over the ransom money demanded by the the anonymous phone caller. Following the threats, the Nixon Administration talked about introducing proposals to ban airlines from agreeing to pay ransoms to hijackers and extortionists. Two more bomb threats were made to TWA in Europe in April 1972 but nothing happened. No further threats were made to the airline. TWA went bankrupt in 2001 and was taken over by American Airlines.